Finances are usually the major objection in people's minds when it comes to adoption. 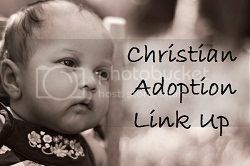 Let's face it, it's hard to think of writing checks for adoptions that could cost $25,000-50,000! Humanly speaking, we like to feel in control and on top of things financially. Most people don't have this kind of money lying around. But it's a matter of trusting God to provide if He's called you to the task. Is our God big enough to do this? Of course! We are thrilled to see that God has already begun to provide for us! Just in the last few days, we have received an extra $200 above our normal budget. That may not seem like a lot, but it encourages our heart that God will provide exactly what we need when we need it. If you want to know ways you can help us financially, check out the "How You Can Help" tab at the top of this blog. We will continue to add information there. There are also several organizations that we can apply to for grants. We will definitely be looking into this as soon as our home study is complete. God provided for our agency application fee last week. This week we had our FBI background checks. Then it's on to our home study. We are challenged by some great examples in church history to let our material wealth be used as a tool for God's glory instead of merely a means of securing comfort and pleasure for ourselves. While there's nothing wrong with buying new clothes, things for the house, toys for the kids, family vacations, we all know that Western society can go way overboard in trying to keep up with the neighbors. Does this glorify God? John Wesley is one great example of learning to live with "enough". Do you know his story? One year he figured out the amount of money he needed to cover expenses. What did he need to live... Not extravagantly, but -- what was enough? He came up with the figure of 28 pounds. Well, that year he made 30 pounds, so he was able to give 2 pounds away. The second year, his income was 60 pounds, so he was able to live off of 28 and give 32 away. By the third year, when his income was 90 pounds, he still lived off of 28. You can probably see the pattern by now. God continued to bless him, and he continued to use his material wealth as a tool. Eventually, John Wesley was one of England's wealthiest citizens, and by honoring God with his wealth, he was able to live on 2% of his income give 98% to the poor. We want to leverage our money so that we can see it used for eternal treasure. The stuff of this world will soon decay, but reaching souls for Christ is spiritual treasure that is eternal! And right now our focus is on pursuing a little girl sitting in a Russian orphanage so that one day she will not only be our daughter, but our sister in Christ as well! Priceless. "If our theology envisions an absent or indifferent God, then we have no reason to be anything but absent or indifferent when it comes to children that don’t share our genetic material. But if we truly grasp that every soul bears the image of God, everything changes. If God pursued and adopted us at infinite cost to himself when we were orphans of sin, then we can do the same…with joy at getting to mirror the heart of our Father." Jedd Meddefind. When we lived in Ontario we used to frequent a bank in the village of Ayr. One day, I took a random glance into a nearby open door and saw my name on the wall. Yes, John Banks was written on a business diploma, from a school I had never attended! After I picked my jaw up off the floor, I strolled in and introduced myself to John Banks. We usually associate our name with our own identity, but have you ever google searched your name? You might be surprised, unless your name is Smith or Chang. Thankfully our identity is not based on our name. The adoption process required us to be fingerprinted and verified against the thousands of criminal records on the loose. My record must have been squeaky clean as I got mine back in a day or two. Ha! Abby's are still out for review. But, where do we get this identity marker from? Scientists tell us there is a high probability that no two people on the earth share exactly the same structural features in their fingerprints. Apparently, neither twins nor genetically cloned humans share the same prints. My own biological children have their own fingerprints, a small part of their unique identity, given by God. Thankfully, even if someone has the same name, we couldn't possibly share the same fingerprint. The fingerprint is a lock-box for our identity. "I praise you, for I am fearfully and wonderfully made." Psalm 139:14. The Bible tells us in Genesis 1:27 that, "God created man in his own image, in the image of God he created him; male and female he created them." Theologians call this principle Imago Dei. This does not mean that man is God, but that the image of God is stamped in mankind, even in his fingers--it is what gives man worth or dignity. Even as marred by sin, mankind bears a reflection of God's identity, God's uniqueness displayed through creative genius. A great theologian once said, "A person's a person, no matter how small." Is it possible that when we reach out and embrace children who are in great need, we actually embrace a part of God's identity? Help us raise money for our adoption with each sip of coffee. Help us raise money for our adoption by shopping on amazon using our link!